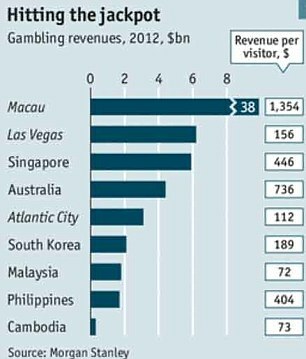 As you can see, gaming revenue in Macau, China dwarfs the revenue of Las Vegas. In 2013, gaming revenue in Macau grew nearly 20% to $45 billion. Compare that growth rate to the 4.8% annual revenue growth rate for Las Vegas, and it’s easy to see that the massive gap is only getting wider. So I hesitate to describe Macau as “the Las Vegas of China” when these numbers indicate that maybe Las Vegas should be considered “the Macau of the U.S.A.” We all know that the population of China dwarfs that of the U.S. (1.3 billion to 300 million). However, while the United States has several places throughout the country where gambling is legal (Vegas, Reno, Tunica, Atlantic City, etc. ), Macau is the only place in China that legally allows gambling. So why aren’t investors flocking to Macau to build new casinos? One major hurdle to expansion in Macau is that companies wishing to build casinos must first obtain a casino license from the Chinese government. Currently, only six such licenses have been permitted, limiting competition to the following license holders: MGM, Wynn, Las Vegas Sands, SJM, Galaxy Entertainment, and Melco Crown Entertainment. So which one of these companies should we be buying (or holding) hand-over-fist? Let’s take a closer look to find out. Galaxy Entertainment Group is run by the Lui family of Hong Kong, and the company is listed on the Hong Kong Stock Exchange. Unfortunately I do not live in China, and since there is no listing for Galaxy on a major American stock exchange, Galaxy is eliminated from contention. SJM Holdings was founded in 1962 by Stanley Ho. Ho is known as “The King of Gambling” in Macau because he and his company own 14 of the 30 casinos in operation in Macau. In fact, Ho held a government-granted monopoly over Macau for 40 years! But before you get too excited about SJM, unfortunately it is also not listed on any major American stock exchange. However, with Stanley Ho now 92 years old, SJM shareholders might be worried about the future of SJM after Mr. Ho is gone. I’m sure he and his board members have been grooming their version of Tim Cook for a while now. Unfortunately, no matter how good of a job Tim Cook does with Apple, he has one obvious flaw: he’s not Steve Jobs. No matter who Stanley Ho’s heir apparent is, he or she will not be Stanley Ho. But wouldn’t it be great if we could find the next Stanley Ho and invest in his or her company? More on that thought later, but first lets take a look at the rest of the Macau casino operators. MGM, Wynn, and Las Vegas Sands are all American companies with casinos in locations such as Dubai, Atlantic City, Vegas, and Singapore. Of course, there’s nothing wrong with that fact, but if your investment thesis (the idea on which you base your trade) is that Macau is the place to be for gambling, why would you invest in a company like MGM that owns 11 casinos in Vegas, but only a 50% stake in a single casino in Macau? Wynn Resorts is a perfectly fine company, but $400 million of its Q4 2013 revenue came from Las Vegas, not Macau. So that leaves Melco Crown Entertainment, ADR ticker MPEL (if you don’t know what an ADR is, check out this post ). Melco owns the massive City of Dreams resort and casino on the new Cotai Strip in Macau, as well as the smaller Altira Casino. City of Dreams opened in 2009 and contains 420,000 square feet of gaming space, 550 gaming tables and 1500 machines, more than 20 restaurants and bars, and 175,000 square feet of high-end retail space. Now remember what I was saying about finding the next Stanley Ho? Lawrence Ho, CEO of Melco Crown Entertainment, is the 37-year-old son of Stanley Ho, and it sure seems like that apple hasn’t fallen far from the family tree. Lawrence Ho is young, ambitious, and aggressively growing his company. After opening City of Dreams in 2009, Ho purchased a 60% interest in Studio City, which is set to open on the Cotai Strip in mid-2015. In addition, Ho spearheaded the construction of the $1.3 billion City of Dreams Manila in the Manila Bay area of the Philippines, which on track to open this year and will expand Melco’s reach outside of Macau for the first time. In addition to the Philippines, Ho has proclaimed that Melco will be establishing a presence in Russia for the first time by building two new casinos near China’s border with Russia. And I’ve saved the best international expansion story for last: just this month, Ho announced that Melco plans to invest at least $5 billion into opening a casino in Japan if/when Japan legalizes gambling, (which it is expected to do in the near future). Ho has indicated that he believes that the potential gaming market in Japan is $20 billion. MPEL’s P/E ratio of 31 is not great, but it’s in the neighborhood of the 27-29 P/E ratios of WYNN and LVS. MGM has had negative earnings over the past four quarters, so it has no P/E or PEG ratios. MPEL’s strength, its growth forecast, is evident by its tiny PEG ratio, especially compared to its peers. The take away from these comparisons is that, while MPEL may be slightly expensive based on its current earnings, it is not expensive at all when you account for its projected growth. As you can see, MPEL has been on quite a run over the past couple of years. However, from a technical perspective, the behavior of the stock has been pretty troubling lately. MPEL has recently broken out of the tight upward channel it had been in since June, 2012. It also broke below a support line at around $37.50. Finally, the double top indicated on the chart is typically a bearish chart pattern in the short to medium time frame. 1. I still believe in the future of the company, so why would I sell? 2. Since I’m only 30 years old, I have plenty of time to ride out a correction in stock price, even if it lasts for months or years. 3. Since I’m already up over 700% on my initial investment, I’m playing with the house’s money. I’m always more aggressive in my trading approach when I’m working with large profits rather than with my principal investment. If you look at a longer-term chart of MPEL, you can see that the stock has had a bumpy ride from $4 to $40. Back in 2011, after reaching $16, MPEL then plummeted back to $7 before continuing its ascent. That’s what I call volatility! Unfortunately, since MPEL has made such a strong and high ascent over the past few years, I fear that the recent technical breakdown could very well lead to a larger correction than the 25% correction shareholders have endured thus far in the past couple of months. So if you are an impatient trader or you can’t stomach the kind of correction this stock saw in 2011, MPEL is probably not the stock for you. However, if you believe, like I do, that the growth of China, Macau, and Melco Crown Entertainment is far from over (and you are patient enough to wait for it to happen), MPEL is the place to be! Want to understand more about what metrics such as P/E ratio, PEG ratio, and EBITDA tell you about a stock? Or maybe you just want to know how the hell I found this stock back in 2009 when it was trading at $4.36??? I don’t have a degree in finance; I have a degree in neuroscience. You don’t have to predict what stocks will do if you can predict what traders will do and be one step ahead of them. I made a 400% return in the stock market in five years using only basic principles of psychology and common sense. To read about how I did it, check out my book, Beating Wall Street with Common Sense, and stay tuned to www.tradingcommonsense.com!